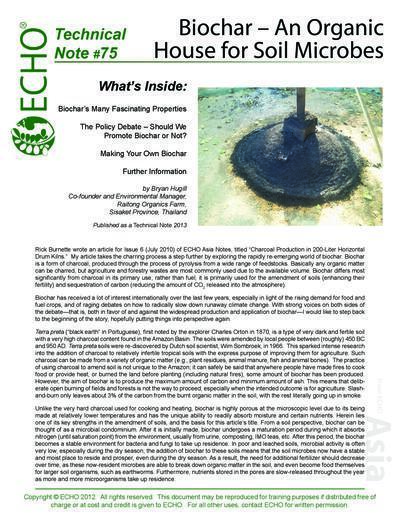 Rick Burnette wrote an article for Issue 6 (July 2010) of ECHO Asia Notes, titled “Charcoal Production in 200-Liter Horizontal Drum Kilns.” My article takes the charring process a step further by exploring the rapidly re-emerging world of biochar. Biochar is a form of charcoal, produced through the process of pyrolysis from a wide range of feedstocks. Basically any organic matter can be charred, but agriculture and forestry wastes are most commonly used due to the available volume. Biochar differs most significantly from charcoal in its primary use; rather than fuel, it is primarily used for the amendment of soils (enhancing their fertility) and sequestration of carbon (reducing the amount of CO2 released into the atmosphere). Biochar has received a lot of interest internationally over the last few years, especially in light of the rising demand for food and fuel crops, and of raging debates on how to radically slow down runaway climate change. With strong voices on both sides of the debate—that is, both in favor of and against the widespread production and application of biochar—I would like to step back to the beginning of the story, hopefully putting things into perspective again.